Bija means seed in Sanskrit, there is one Bija Mantra per petal in each flower of the 7 chakra. Last chakra is the thousand petal chakra and there is no sound for it. 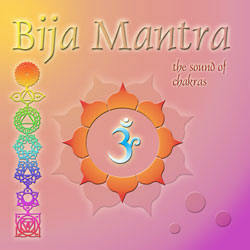 The Bija Mantra CD contains 7 tracks, one per chakra, the phoneme corresponding to each petal has been processed through complex mathematical algorithms (Chirp-Z transform and special designed filter) extracting the unique frequency ratios that represent its vibrational content. The result is an incredible vibrational experience, in my understanding containing the true core of how a sacred language codes subtle information in the proportions of the main frequencies that create a phoneme. After some sessions of intensive listening you perceive multidimensional sonic mandala. This CD is a powerful consciousness enhancement tool you can use to deeply understand the true concept of chakra through the vibration of sound. It is not another chanting CD, it is not relaxing music, no mantra singing, no computer sound effects at all, no synths, just the pure sound of the Sanskrit phonemes grouped by chakra. I studied Sanskrit phonetics in detail so I could find the right position of the whole voice ‘instrument’ to issue each one of the vowels & consonants. This is something far beyond harmonic chanting which I have been studying and practicing for years. i had the choice to use pre-recorded material but the quality was poor and the intention was not that clear. I recover the whole list of Sanskrit phonemes grouped by chakra, the Bija Mantra list. I repeated all phonemes until I felt I was doing the right thing, comparing with other sources specially from India, Sanskrit is very close to the languages I speak (Spanish, English, French, Latin) so this task was successful. I recorded each phoneme in a special echo-less asymmetrical wall recording studio with high quality microphones and analog pre-amplifier so I could get the pure sound of my voice. Recording material was packed in 32 bit sound files for further processing. Using specially SW I designed and programmed, I extracted the core frequencies of each phoneme that closely match other from different sources, not with normal FFT but using much more accurate Chirp-Z transform, so this is really the accurate vibrational essence of the phoneme and they closely maintain independently from who issues them, but using accurate tools these proportions are much exact and conform a vibrational geometrical patter (sonic mandala). these sets of frequencies are then grouped by chakra from 1 to 6. 7th one has no sound so I’ve used a crystal bowl hit. Again using 32 bit processing in mixing and editing. So this is the pure vibration of the sounds of chakras it’s the other way round -from voice to vibration- once developed by Rishi people several thousand years ago, It’s the returning path to the origin of sound as a tool for creation and self development. I feel happy about using high-tech resources for all this process, this means we can also approach reality with part of out western left-minded culture, but this is just the starting point. explore VoiceSync complete CD collection!